Scrutinies for the Elect: Prayers for our Seven! The season of Lent coincides with the Purification and Enlightenment phase of the RCIA process. The Scrutinies are celebrated at the 11:30am Mass on the third, fourth and fifth Sundays of Lent, this Sunday, April 7, being the last. During the Scrutinies with our Elect, we look within ourselves to find anything that keeps us from Christ and then look to Christ to heal those weaknesses and to strengthen us as we face further temptations. Please keep our seven members of the Elect in your prayers. Read more about Scrutinies for the Elect: Prayers for our Seven! The Schola Cantorum this Sunday draws from a rich and varied palette of choral music, including renaissance motets from 16th century Italy, Germany and England,18th century America, as well as music from modern composers from Scotland and Chicago. Read more about this work of Palestrina being rehearsed below - part of this Sunday's 10am Latin Mass. If you are a Catholic who has been away, or “used to be Catholic” we invite you to be an active part of us again. Landings is a Paulist Ministry run by St. Matthew's Cathedral parishioners and aimed at welcoming Catholics who want to deepen their faith and commitment. Read more about Thinking of Returning? Join us at the Cathedral for one of our Masses of the Resurrection of the Lord. You are most welcome! On Monday, March 25, we celebrate the Solemnity of the Annunciation of the Lord. Join us on this beautiful solemnity celebrating a pivotal event in salvation history. Listen for the cantor and organist at our 12:10pm Mass! 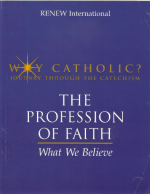 Lenten small groups will read and reflect upon "The Profession of Faith: What We Believe – A Faith Journey through the Catechism." A group will begin meeting on Sundays starting March 10 at 4pm in the East Conference Room, and another on Mondays starting March 11 at 7pm in the St. Matthew's Education Center, located at 1726 N Street St. NW. Order your book and sign up now! Calling all Nouwen fans: Join us on Monday, March 11 at 6:45pm in the West Conference Room as we discuss “In the Name of Jesus: Reflection on Christian Leadership,” by the beloved Father Henri J. M. Nouwen! The final phase of work on the Cathedral Great Organ began in the summer of 2018 and will be completed later this spring 2019! Do you know someone who can't get to Mass on Sunday? Share this flier on 'The Sunday TV Mass," courtesy of the Archdiocese of Washington.